I spent this holiday week at my friend's beautiful home. I took care of her two pugs and sipped my tea in her backyard. As beautiful as her home is and as much as I enjoyed the quiet, something was different. All the usual backyard birds graced her yard, robins, gold finches, cardinals, catbirds, blue jays, crows, even an eagle flew high in the sky above me, with the very brave red winged black bird darting at it's tail feathers. After awhile I realized what was different. The birds, they kept their distance. They were not familiar with me. You see, when I am at home and step out of my house, the birds have come to recognize me. I put out seeds in the winter, water baths are placed randomly through out the yard in the summer. When they fly over to see what I am doing, I will whistle softly to them hoping that I am communicating kindness to them. I guess you could say we have an enjoyable relationship. Is this how the Lord feels when He sees us and we just go about our business and don't have fellowship with Him? Does He feel like something is missing? I only hope I never make Him feel this way. I will remember that the Lord is in my garden, welcome His presence, and spend time with Him. What an interesting way to think about one's relationship with God. How neat that you've built up a relationship with the birds in your yard! 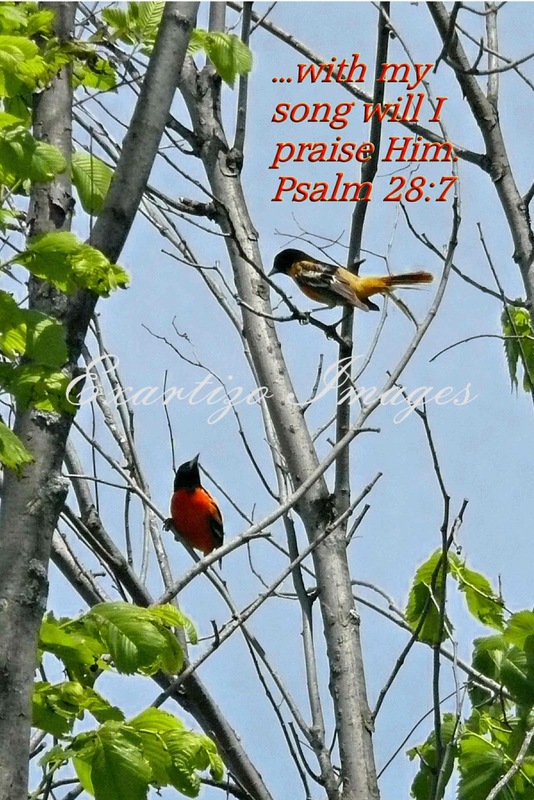 Hearing the melodious call of the Oriole is a song of praise in itself. It is also a gift to be in the presence of these sounds from nature.